The Jaguar is aimed at motorboat fans, but equally at sailors now looking for the efficiency and ease of a powercat. Power cats really have got the wind in their sails, and builders are continually bringing out new models for an ever-increasing clientele. With the Jaguar 48, it’s the aesthetics which are going to delight! The story of the powercat is a recent one, the first yard to have tested the water being Jeantot Marine with the Euphorie in the early nineties. 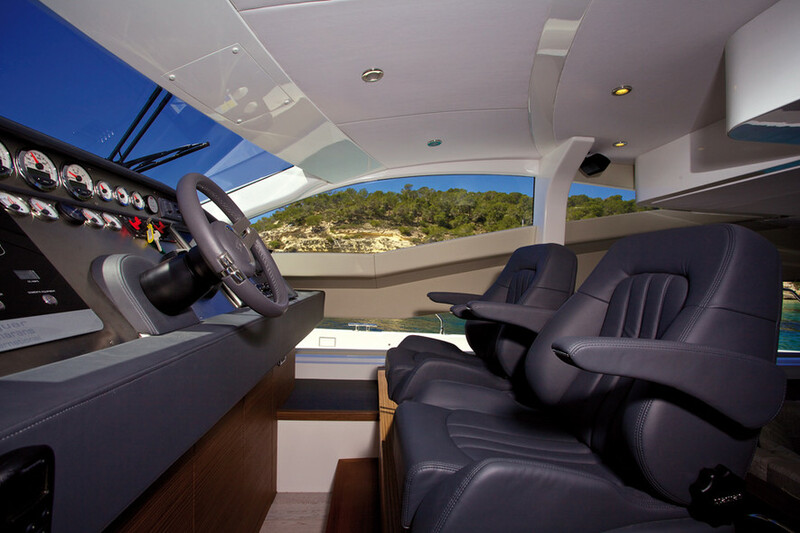 The seductive idea of combining all the advantages of a catamaran - comfort, elegance, speed and privacy - and those of motorboating, was not however, immediately seductive. 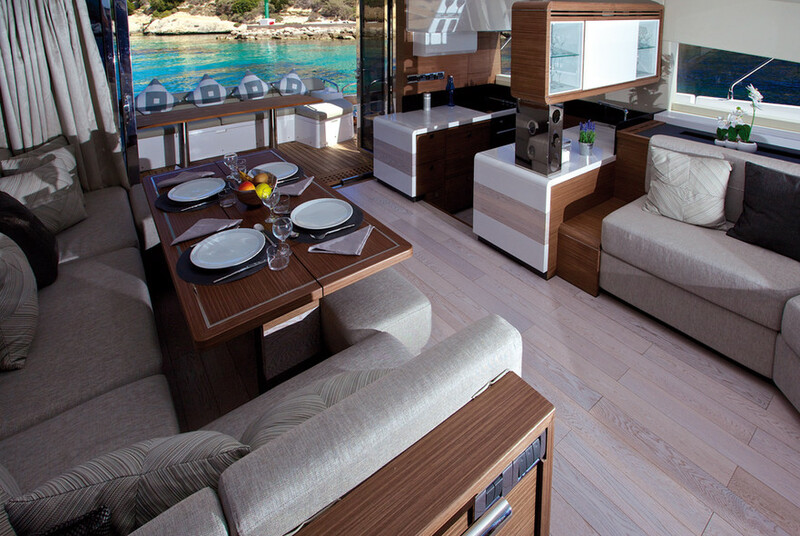 Sailors, while convinced by catamarans, were not quite ready to go over to motors, and motorboat fans couldn’t see the interest in such a project… And then Fountaine Pajot took the plunge in 1998, with the Maryland 37, and today offers a complete range right up to 55 feet. Lagoon tried the concept with the successful Power 43 which later became the Power 44 and is coming back this year with the 630 MotorYacht, and is preparing some nice surprises for powercat enthusiasts. Other yards are also getting the feeling that the future of motorboats is inevitably moving towards catamarans. From Sunreef to Leopard, Aquilla to FlashCat, the ranges are developing to meet increasingly demanding and diversifying requirements. Just as with sailing, the catamaran has some strong arguments to put across over the single-hulled motorboat. Comfort, space, privacy and most importantly, safety and reduced fuel consumption are the most undeniable of these. What’s more, designers are now understanding how to enhance multihulls, and it’s clear that powercats (or tris) look rather sporty. The inside helm station and its two great seats: there’s going to be a fight for who’s on watch! Jaguar has a delightful history, given that at the origin of this powercat, we find the British Lagoon Power 43 / 44 dealer. When the yard decided to cease production of the power 44, clients were understandably asking their dealer which boats they should be looking at as a replacement vessel for those to which they had become so attached. After looking very hard for this rare gem, and looking at what was missing from the market, the team then decided to go for it. And so Jaguar Catamarans was born. To create a beautiful motorboat you need more than ideas, you need to be able to put them into practice. For designing the new range the yard called on Dixon Yacht Design. They then decided to build the boats in Asia, at one of the most reputable yards, which has produced among others, the Gunboat 60, Hakes Marine and other Motor Yachts from known British brands. In short…a great team! Inside, the table is opposite the galley.